Ibiscus Residence is located at Massouri of Kalymnos, an island of the Dodecanese at the south-eastern edge of the Aegean sea. 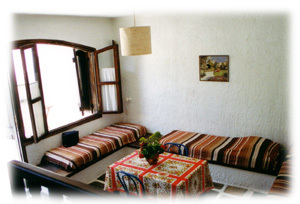 It is made up of one or two recently built and fully equipped studio apartments. They are built in the traditional island-style. 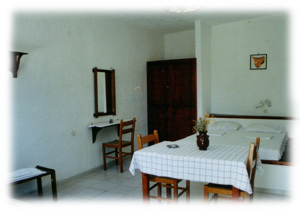 Studios are made of one large room, which includes a double and a single bed as well as a fully equipped cooking area, and a bath with shower. The apartments are made of a fully equipped kitchen, a large living-room also containing three single beds, a bedroom with a double bed and a bathroom with shower. Each apartment and studio has its own balcony. From almost all apartments you get a panoramic view of the lovely island of Telendos, the ideal scenery for your breakfast, meal, coffee or dinner. 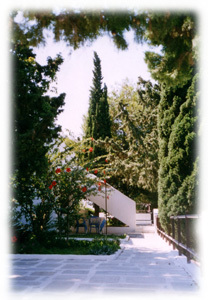 Ibiscus Residence is located right next to the main street of the Massouri village and just two minutes on foot from the central square of Massouri, where buses, taxis, restaurants, bars also serving all kinds of breakfast and shops selling Greek traditional handicrafts, can be found. Within the Residence a mini-market with a very big variety of products can also be found. Within Ibiscus a motorbike-rent shop is also available. Check out their web site for online booking and extra-information. . Ibiscus Residence is only 30 meters from Massouri�s main beach, a long sandy beach offering all kinds of tourist�s service from sun-umbrellas and sun-chairs, to canoe and pedalos-renting, a mini-football and volleyball sandy field. Two bars serving all kinds of drinks and food are also available. At a 15 minutes on foot-distance from the residence at the tiny harbor of Myrties the boat line to the island of Telendos, a visit to which can�t miss and certainly will never forget. Generally the whole region at Massouri and its surroundings will offer a sequence of sandy, stony or rocky beaches where you can have some of the most enjoyable swimming in your life.